expect. Most people living within the U.S. have heard that there are a few princes over there in England and may even know their names - William and Harry (for two). If we delve a little deeper into the lives of the Royals, which many Americans ignore or avoid based out of some historically and genetically passed on bias, than we also know of another major life event recently - the birth of a son to Prince William and the Duchess of Cambridge (or William and Kate - most folks in the U.S. heard and knew about their fancy wedding not too long ago). Not all countries "cut their ties" with the British Empire quite the same way we did, point in face, the country of New Zealand sees their relationship with England quite differently than the U.S. does. There is a sense of excitement in the news and in the way people talk about the birth of this new prince that is different from back home. I have been searching fruitlessly from afar via the web to see if I can figure out just exactly what our President and the White House will be doing for a baby gift - all I can find are old stories wondering at what they will get for them (forgive me if I just cannot find it - perhaps the shut down has preoccupied them as well). The country of New Zealand has put together a fitting gift - a hand-spun, hand-knitted fine lace shawl - click the link to read the story (reported to us by people Sarah works with as Merino wool which is awesome stuff). Sarah has been eying merino wool since we landed in the country. My favorite definition for it I have found so far is found at this retailer's website that works with the stuff - click here. A shaw hand woven from merino wool sounds like a pretty amazing gift no? I wonder how much such an item would cost to have made. New Zealand as we go. So if we visit somewhere like Queenstown, as we did for skiing, there will be more about the city and its history. 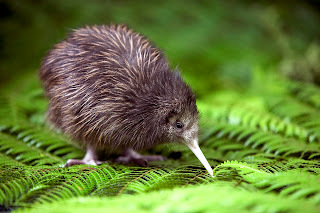 The Kiwi bird has made discussion once or twice in the blog and I wanted to revisit it a little bit in this one. This flightless bird is the national bird of New Zealand, but similar to our national bird there is one major problem - it's bordering extinction. The Kiwi bird has thrived in New Zealand for quite some time but, as far as I have learned so far, there are two major problems: it does not reproduce very quickly, and the introduction of new predators who were not originally part of the ecosystem here (cats, ferrets or "stoats" as Kiwis call them - [the people not the bird], rats, and other such things). It sounds as though the biggest perpetrators are the ferrets and feisty opossums, which seems funny because opossums do not seem to scary to me. Let me tell you there is a different kind of opossum then I've ever seen before, dubbed by some the Kiwi bear, and then even on top of that there is not much defense for a flightless bird from such foes. There are all sorts of traps set out in the reserves trying to catch/kill/deter/and hold the stoats from their deadly work against the birds and plant life. There are even people who take it upon themselves to hunt these new trespassers in the hope of helping out a little bit while also making a few coins on the pelts of their victims (in one book Sarah read about a woman who went to Antarctica, she bought gloves lined with opossum fur due to its insulation powers). (just released from prison finally) era trying to put the country back together in a struggle to unite, not divide. In this movie, if you watch, you will learn about an ancient and worthy rivalry between the South African Springboks and the New Zealand All Blacks (I have been told Kiwis are not a huge fan of this movie in that it really sort of vilifies the All Blacks of course). This week the All Blacks and the Springboks played and the All Blacks defeated the Springboks in Ellis Park (South Africa and if my facts are correct at this particular location) for the first time since 1997 when I was in my senior year of high school and Sarah was an eighth grader! The captain of the All Blacks team remembers watching that match and thinking it would be amazing to play in that stadium one day - pretty cool. This is a day in the life of New Zealand. Hope you have enjoyed the short glimpse into the world down under.